This past weekend in eastern Massachusetts, volunteers from near and far came together to celebrate National Trails Day on a sunny, summery day in the Bay Circuit Town of Concord. The group included an enthusiastic mix of individuals and families, ranging from avid hikers getting their first taste of trail work to experienced trail stewards. Trail projects took place on several notable properties. 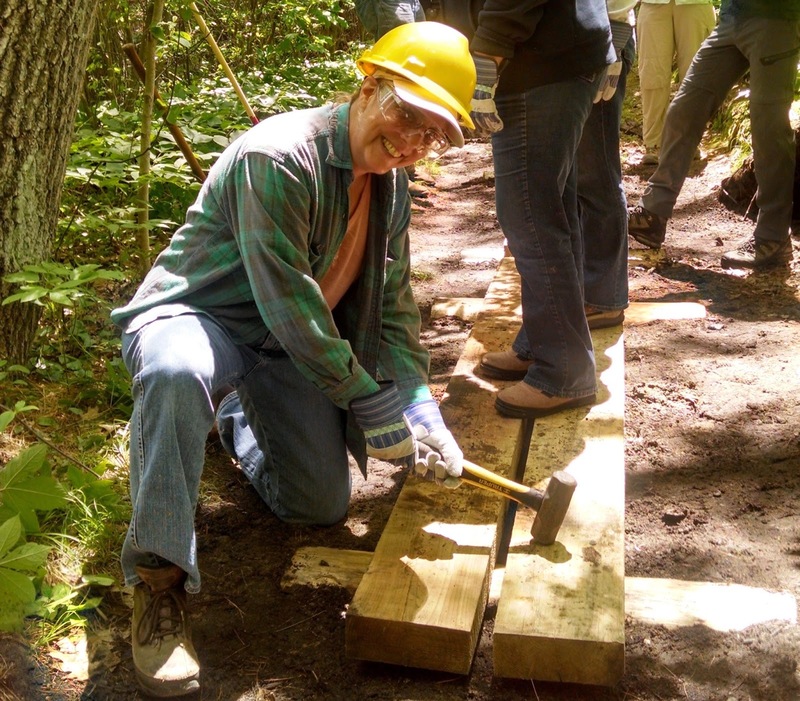 One group installed bog bridges in the Hapgood-Wright Town Forest, a woodland that was once frequented by members of the famous Thoreau, Emerson, and Alcott families. This group also helped preserve the ecological and cultural integrity of the adjacent Brister’s Hill property by pulling invasive buckthorn shrubs from around an interpretive trail. The property was one of the places Henry David Thoreau’s studied ecological successional and was named for Brister Freeman, a freed slave and abolitionist who fought in the American Revolution and lived nearby. Across town, another group improved the recently-conserved Domino-Nocella property by installing an informational kiosk, removing invasive Japanese knotweed, and cutting new sections of trail to make the area more inviting and accessible. Thank you to all the volunteers who spent their Saturday getting sweaty and dirty in service to local trails and conservation! There are more opportunities to get out and give back around the Bay Circuit Trail throughout the year. 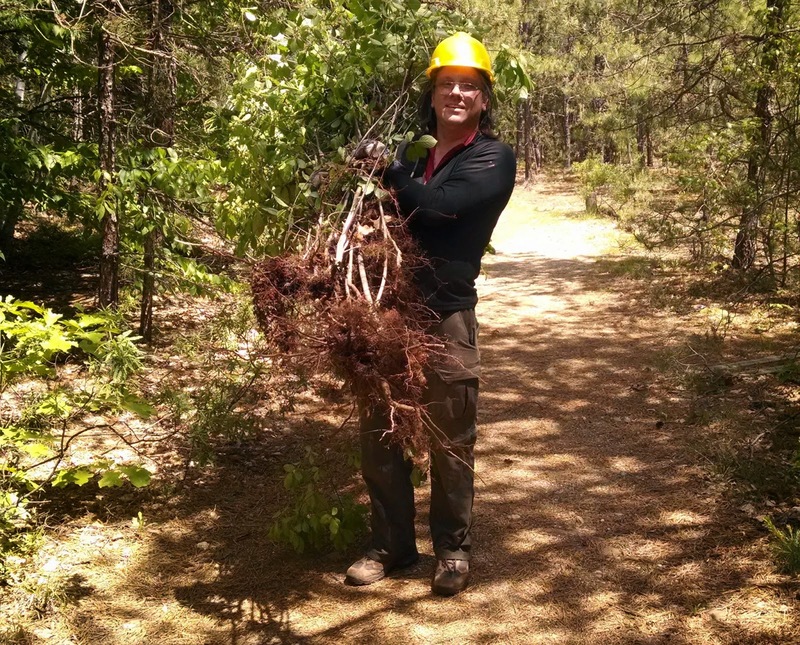 Check out our Saturday work party dates and sign up today for your chance to learn new skills, enjoy new outdoors places, and give back to community trails. Special thanks to the Concord Trails Committee and the Walden Woods Project, as well as REI for their ongoing stewardship support and generous donation of volunteer t-shirts, Arcadia Charitable Trust, 1% for the Planet, and the American Hiking Society.